As some readers may know, I’ve been working on a new version of ACOM Director for some time now. Progress has been slow due to work commitments however the new version will be available in the next couple of months and will provide full support for the ACOM 600 in addition to the ACOM 2000. The image shows a screen shot of a the new user interface which mirrors the ACOM 600 display, don’t worry if you prefer the ACOM 2000 look and feel though as that will still be supported. 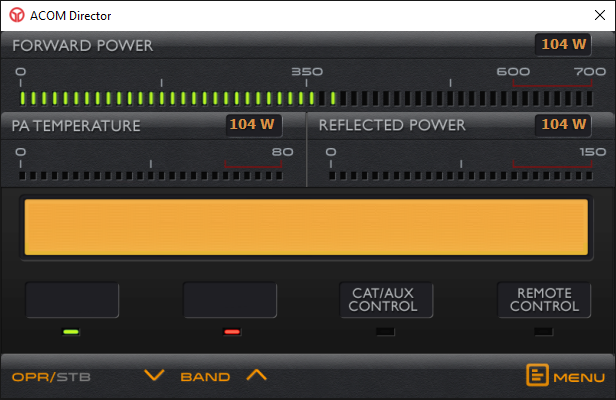 Whichever amplifier you use you can select any of the displays, so if you run an ACOM 2000 but want it to look like the ACOM 600, that will be supported. Whilst the main change will be support for the ACOM 600, many other enhancements will also be included. I’ll post more updates as I make further progress. any plans to release a version of your software for OS X? Unfortunatly not at the moment. Any progress on the nw Acom-director for the 600S? I’ve just posted an update. Some news for acom director 2.0 ? Looking forward for the 600 support. I’ve just posted an update you may want to take a look at. Very early version with ACOM600 support.